Praeclarus Press once again partners with Shabnam Resources in Chennai, India support breastfeeding peer counselors who work in low-income neighborhoods and villages to distribute breastfeeding education and food packages to pregnant and postpartum women. This program is part of Praeclarus Press’ commitment to giving back to the community and was done to celebrate National Breastfeeding Month. Many do not understand the full value of breastfeeding, so it is our concern to promote it in any manner, so as to raise healthy babies. The World Health Organization estimates that 1.5 million infants die each year worldwide from not being breastfed. The rate of infant mortality is highest in developing countries, especially among families living in extreme poverty. To address this need, and in honor of World Breastfeeding Week and National Breastfeeding Month, Praeclarus Press is proud to continue its partnership with Shabnam Resources in Chennai, India, in their work to promote breastfeeding in poverty-stricken neighborhoods. In 2015, Michael Hubert, Director of Shabnam Resources focused the organizations efforts on breastfeeding education and training peer counselors who were qualified to work out in the community. Breastfeeding education is essential for increasing the numbers of breastfeeding mother, the length of time they choose to feed, and for decreasing infant mortality in some of the poorest neighborhoods within India. 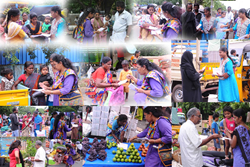 This year efforts were focused on the families as they participated in shandies, the well known open-air, village markets where the producers of many villages are brought in on a weekly basis to directly sell to consumers. The Pallavaram Shandy is on the exterior of Chennai. Covering a distance of roughly three miles, the market remained open for more than 12 hours each day, allowing Shabnam Resources to access many villagers. The target audience for 2016's outreach program included: traders, farmers, poultry owners, village brethren, and women. Additionally they were able to access various groups of differing religions and castes. One surprising thing the counselors noted was that men are becoming more understanding and supportive to the breastfeeding cause which is a breakthrough. The awareness campaign included short presentations to groups of women and one-on-one conversations, with a multitude of relevant issues being discussed. They counselors did note the infiltration of processed infant foods, which have been marketed to the villagers as convenient, hygienic and healthy. Continued annual sponsorship of this program is part of Praeclarus Press’ commitment to giving back to the community by supporting programs that reach out to mothers and babies in the U.S. and other parts of the world. This program celebrates both National Breastfeeding Month and World Breastfeeding Week. Shabnam Resources Trust is a registered non-profit charity focusing on children’s and young mothers’ welfare in rural and semi-urban areas in India. Shabnam means the first refreshing rain after a dry spell. It is based in Chennai, India. Praeclarus Press is a small press specializing in women’s health owned by health psychologist and lactation consultant, Kathleen Kendall-Tackett, PhD, IBCLC, FAPA. Praeclarus means excellent. Praeclarus Press’ mission is to provide books and other educational materials that change women’s lives. Praeclarus Press is based in Amarillo, Texas. A portion of all sales go to support programs like this.